As promised here are some pics of the new Jamie at Home items. Some of these are from the party I attended a while ago but there are also some of my new purchases that arrived yesterday, also got lots of lovely things for people for Xmas which shall remain hidden! 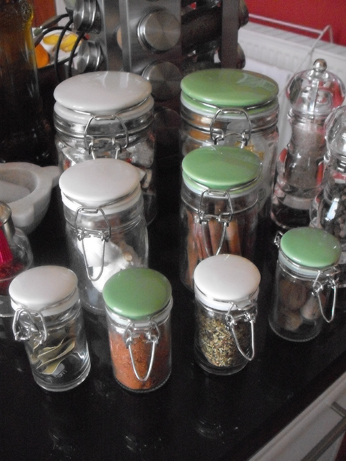 I couldn’t resist these – ceramic topped versions of the traditional Kilner jars which I thought were very cute and very good value – tiny ones £2.50 and largest ones only £6 each. And here is my mezzaluna! I have wanted one of these for years – I bought my brother one for Xmas a long time ago but no-one has returned the favour so had to get myself one. 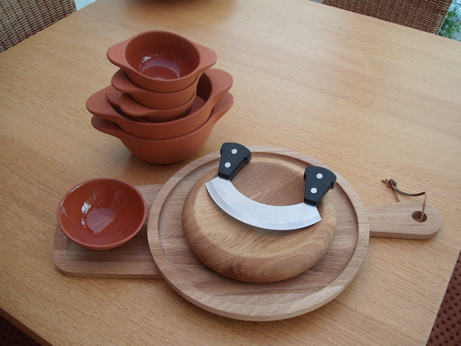 It is a device for chopping herbs etc with a shallow bowl and double handled blade. Underneath that is a round wooden plate and I also bought the long bread and dip server and an assortment of terracotta bowls for tapas. Am planning to do lots of entertaining in this glorious summer we are going to be having! Well it has been lovely weather here – last night I got home late and so when I had finished tea sat outside with my free Jamie magazine and a couple of glasses of wine and just enjoyed the garden and the birdsong. Today I also sat out after tea for another hour or so – I really do love this time of year! Am planning the first BBQ of the season tomorrow – wish me luck! 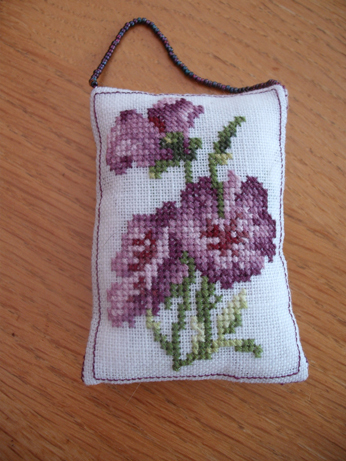 I also had a lovely piece of stitching in the post – my Spring Ornament from Terry through ASOE arrived. It is now hanging on the patio doors to complement all the lovely flowers I can see in the garden. I really like the beaded hanging string – I often get stuck when trying to match stitching colours to braid for hangings and had not thought of doing that before. Hopefully my piece for her will arrive soon so that I can show you pics of that. Hope that you all have a lovely sunny weekend – thanks for visiting.